Preheat oven to 350 degrees. Line a 15 x 10 x 1-in. baking pan with foil; grease foil. In a small saucepan, melt butter over medium heat. Stir in brown sugar, rosemary and thyme. Add nuts; toss to coat. Spread into prepared pan. Bake 10-12 minutes or until nuts are toasted. Immediately transfer to waxed paper; cool completely. Store in an airtight container. 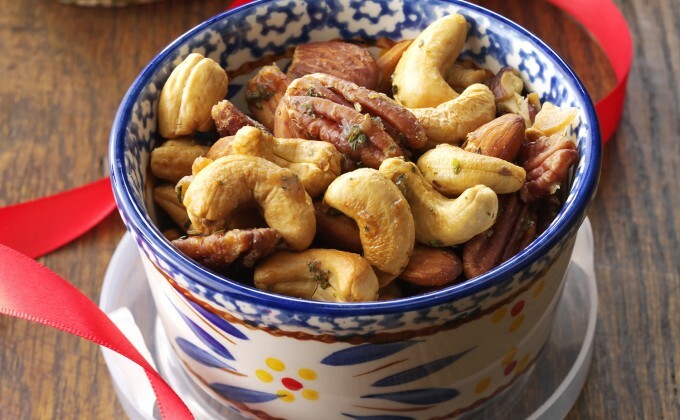 For gift giving, place nuts in temp-tations® 6 ounce ramekins. Make Ahead: Can be frozen for up to 3 months.